Nothing can stand between Pac-Man and his food! Pac-Man is back! While he was away, the ghosts have been harvesting fruits and are keeping them hidden behind locked doors inside their maze. 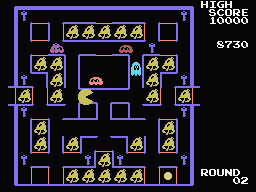 But that won't keep Pac-Man away for very long, especially with the ghosts carelessly leaving the keys lying around, and with Pac-Man having a new SUPER trick up his sleeve! 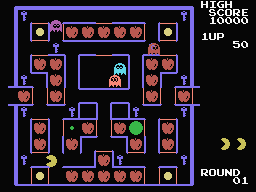 In this adaptation of the famous arcade game, you play as Pac-Man, and your goal is to gobble up all the fruits while evading the ghosts. Collect keys to open locked doors. Eat a Power pellet to gain the ability to gobble the ghosts for a short time. 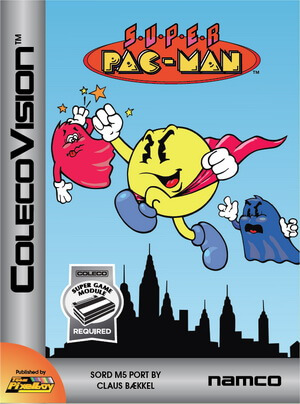 Eat a Super pellet and you will grow into the unstoppable Super Pac-Man!